BIS development. Is it necessary? Blender Interplanety Storage (BIS) add-on is still under development, but I decided to open early access to it. This add-on is the first, which I planned to do at least somehow commercially justified. Is it really possible to write a commercial add-on for Blender? In any case, it is necessary to have at least some support for the add-on, because it is not local and without any justification, it makes no sense to keep the web server for it. The first idea of commercialization was about the monthly subscription. I was going to do it after finally finish the addon development (full support of all kinds of nodes and solvation of the most of emerging issues). Only after the completion of all this work I was going to open the add-on for users. The reason of the early access was the discussion in Blender’s VK group. It was suggested that add-on with a commercial basis is not needed with the presence of Blender Cloud or VX Matlib add-on. Users will not pay for anything that can be obtained another way for free. So the first, and most important, question – are users need such add-on? In the subscripted version or only for free? Or maybe most of the existing solutions are enough? To demonstrate what the BIS add-on can do, I opened the early access. At the current stage, the add-on can store material (a group of nodes) in the storage. 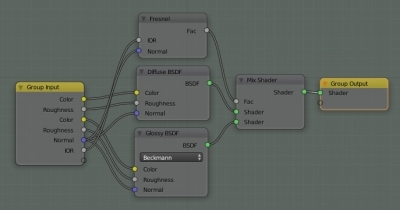 Not all node types are supported, for example, texture nodes and ColorRamp node not supported yet. However, the basic “Diffuse + Glossy by Fresnel” material can be stored. Saved material can also loaded from the storage. A simple search, by the node group name (or a part of it), or by assigned tags, is realized too. The add-on requires creating an account on its site. Through this site, users can set previews for the saved materials. I see that there is a fat minus as for commercial both for the free variant of the add-on. I have certain thoughts about automatic preview generation, which again stops near the question – do users need such add-on at all? With further development, I can try to expand add-on functionality to store not only materials but also meshes, UV-layouts, etc. But again, it’s all only if the add-on will justify at least the developing efforts. Thinking about the fact that the addon is desirable to be free, such an idea was formed: since users are still linked to the site account, the add-on can be provided through banners. But for this, it is necessary for users to visit the site. Therefore, I made a limit number of active materials in BIS storage for free users. Now the limit is 15 active materials. For the beta test duration. I think to reduce the number of active materials to 5 in future. The active number limitation does not mean that the user cannot save more than 15 materials. You can save as many materials as you need. However, if the active materials limit is exhausted, to store the new material the user need to empty the slot by transferring one of the stored materials to the inactive section on the BIS site. Inactive materials are not searched and are not loaded through the client part of the add-on in Blender. If the user will use the add-on by subscription, all restrictions will be removed. If the user uses the addon on a free basis, he can save 15 (later – 5) materials. The user can continue to save more materials, freeing the slots by transferring materials into the inactive zone. Through the add-on in Blender, the user can access only for the set of 15 active materials. If the user needs one of the previously deactivated materials, he deactivates one active material and activates the necessary material from the inactive through the BIS site. So the necessary material becomes accessible to him through the add-on in Blender. Such system allows to conduct free users through the site and saves the subscribers of this. How do all these ideas look from the user’s side? Are there any chances to realize this idea, or it will scare everyone away? How does such a system look like in general? And I will be happy to consider any other ideas and wishes regarding the development of the add-on.